Big "I" Markets' Eagle Express provides market access to MetLife Auto and Home and Travelers personal lines products. Our company partners, MetLife and Travelers are committed to personal lines. They are known for their comprehensive products and excellent service to the policyholders, communities and independent agents. Eagle Express has been partnered with MetLife Auto and Home and Travelers for more than 15 years. Eagle Express is able to quote for our agents in 46 states and the District of Columbia* with no monthly policy commitment or production goals. The agency maintains 100% ownership all business written. What's the Market Appetite for Eagle Express? How Does Eagle Express Work? Find Eagle Express on www.bigimarkets.com. Under the "Personal" tab select "Eagle Express: Auto & Home New Business" and click on "Request a Quote." Complete the online application for the desired coverages and submit. The Eagle Express underwriter underwrites and quotes all acceptable risk. Most quotes are returned within 24 hours. For more Eagle Express program information, visit the "Underwriting and Coverage" page for Eagle Express at www.bigimarkets.com or email Jodie Bacote at jodie.bacote@iiaba.net. *No Quotes provided in Alaska, Hawaii, Michigan, Oklahoma. HR teams are savvier than ever about personality assessments and want to dig deeper when evaluating top performers. The days of creating job descriptions that include a list of tasks or traits one must possess are becoming less relevant. 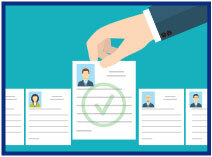 As a result, a best practices hiring approach is shifting toward competencies. Competencies are bundles of personal attributes, such as personality traits, motivational factors, knowledge, and skills that come together with the work environment to give rise to strong performance in business-critical outcome areas. Using competencies when hiring dives deeper into someone's potential to do the job and helps you answer questions such as: How does this person's personality play into their motivations on the job? How can they best work in the current role, and what potential do they have in the future with your company? Big "I" partner Caliper recently completed a massive, multi-year research project to identify the competencies that point to success in a variety of jobs across all industries. And they'd like to share their findings with you. Join Caliper Tuesday, March 14, 2017 at noon EDT for a free webinar on How to Use Competencies to Hire Top Performers. Learn more about your Big "I" discount on Caliper testing and services at www.iiaba.net/Caliper. With the ongoing changes occurring in the affluent market, the Big "I" Affluent Program has recently revised its eligibility to help you compete against new options your customers may be considering. 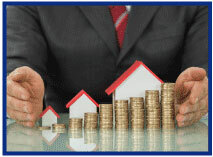 The program on Big "I" Markets is now accepting $500,000 dwelling values for both AIG and Chubb. Monoline home will be considered, but a minimum of two lines is recommended for better account consideration. For example, consider offering a $25,000 blanket collections along with the primary home. If you're not sure what might be the best combination of lines, be assured your Big "I" Markets underwriter will review your account for any opportunities to apply credits and contact you to discuss prior to submitting the account to the carrier for approval. Big "I" Markets has a team of underwriters and service representatives ready to answer any questions and assist you in placing business with AIG or Chubb. Log in to www.bigimarkets.com and select Affluent Program New Business from the personal lines menu today to try it out. BORs are also welcome; details on the process are located on the Affluent Personal Lines Broker of Record Change on Big "I" Markets. If you have an account you would like to discuss first, or to learn more about the carriers and their appetites, please don't hesitate to contact Nancy Doherty at nancy.doherty@iiaba.net or (800) 221-7917 ext. 5389 or Aysha Jordan at aysha.jordan@iiaba.net or (800) 221-7917 ext. 5382. Does Your Website Have a Personal Umbrella Page? If you write personal lines in your agency, it should. Without such a page you are missing the chance at 21.5 prime personal lines leads per year (average agency). Source: See Source and Computation Table at End. Why do you need a page on your website dedicated to personal umbrellas? Because there are a lot of people on Internet every day searching for a personal umbrella. I estimate about 1 in 50 are focused primarily on personal umbrellas. These are prime opportunities for independent agencies as umbrella leads are going to be for prospects that are well established in life. They NEED an independent agent. Plus, you don't want your customers going to the web and not seeing your agency. Apparently a lot of people do go and search for information on personal umbrellas. 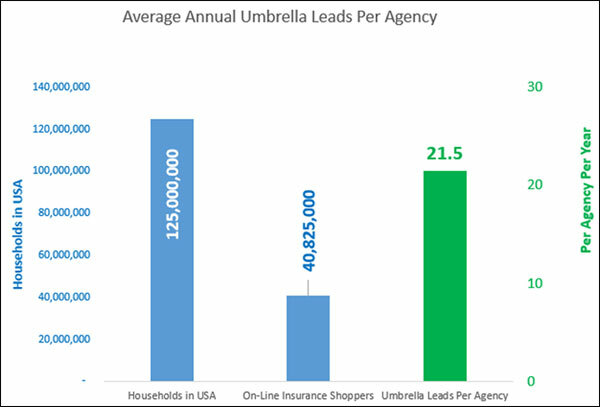 We estimate about 1 in 20 homeowners policies are matched with a personal umbrella in the average independent agency. That is lower than it should be in my opinion and if your customers think it through, they may go to the Internet to research umbrellas. I recommend the average agency strive for a ratio of at least one umbrella (1 PUP) for every five homeowner (5 HO3, H04 or HO5) policies. Your customer's financial planner observed: "You are worth $5 million and you have $250,000 of liability insurance on your home and car…"
Your prospect's direct writer salesperson was stumped by the consumer's situation and couldn't offer them a personal umbrella with their limited choice of one market. Your customer went bike riding with me and I said, "Yikes, that car nearly side-swiped you…what do you mean you don't have Uninsured Motorist on your Umbrella?" Our endorsed standalone PUP insurer, RLI, and I discussed this situation and we reviewed data they had access to on individuals searching the Internet for personal lines insurance. We believe about 1 in 20 searching the Internet for personal lines insurance is specifically interested in personal umbrella coverage…about half the time specifically only an umbrella policy. Of course, we endorse RLI as your "go-to insurer" for the umbrellas that don't fit your standard market. We also have an alternative market for the really tough risks or higher limits. RLI information is accessed via your state administrator and you can find that on Big "I" Markets or by going to www.iiaba.net/RLI. E&O Happens! Oh, yes, if your client doesn't want an umbrella or they don't want Uninsured/Underinsured Motorist coverage on their umbrella? Document those with a quick send with DocuSign of an umbrella declination that you can download here. Chubb - Cyber and Identity Theft: Managing Your Family's Risks. Congratulations to our agent in New Jersey on an Cyber Liability & Security sale of $16,213 in premium!